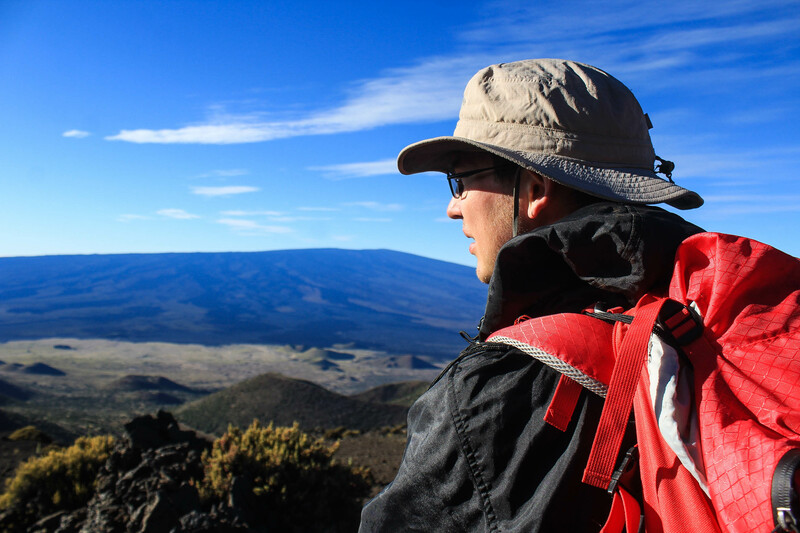 Having successfully completed our 4 day backpacking trip on Mauna Loa, we felt as ready as we’d ever be to finally hike Mauna Kea. Our only concern was the weather. What if we worked so hard only to be turned away by strong winds or rain? We were camping in Hawaii Volcanoes National Park, about an hour and a half away from the Mauna Kea visitor’s center and trailhead off of the Saddle Road. While we were in Hilo stocking up on supplies, we wrote down the phone number for the visitor’s center automated voicemail that gives updates on the weather. 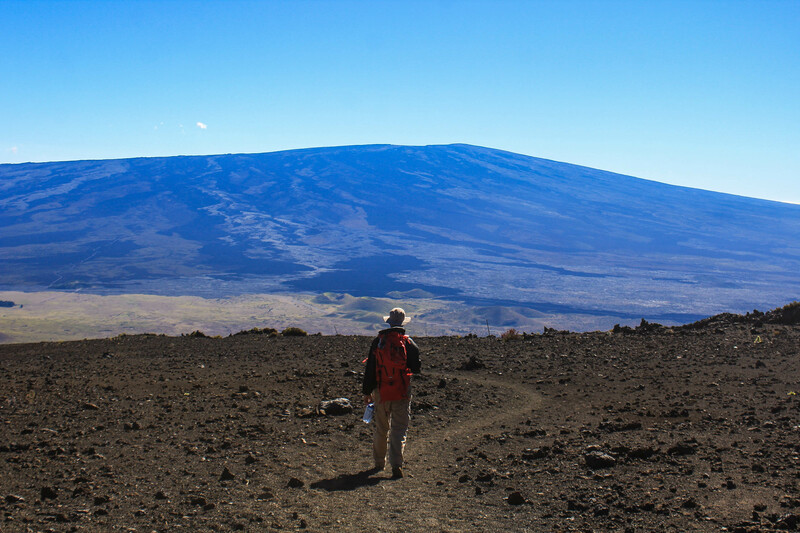 We called that night and the report seemed fine with nothing to be concerned about, so we made our plans to hike on the day after finishing Mauna Loa. Learning from our mistake with being so calorie starved while backpacking, we stocked up on snacks and a few more meals, then ate an entire pizza while driving from Hilo back to our campsite. We turned in early and had a perfectly peaceful night camping in the National Park (more details on our time in the park will be shared later). Finally, it was time to begin the trail. I was very excited to not have to use my big backpack again. Since this was just a day hike, all we needed was lots of food and water, so I carried my camelback and Curtis took my backpack. We wore the same gear we had on Mauna Loa — long sleeved shirts, fleece jackets, and windbreakers. We set off on the road, walking a short ways up until our trail, the Humu’ula Trail, went off to the left. 6 miles to the summit! Yes, there is a road that goes to the summit of Mauna Kea. However, much of it is unimproved and most rental car companies don’t allow people to drive up. 4WD is recommended/required, and the road will often be closed for various reasons. Of course, driving up wasn’t even a consideration for us — we HAD to hike. Our spirits were quite high as we began. While a few other people had driven up to watch the sunrise at the visitor’s center, we were the first and only hikers on the trail. I wouldn’t have minded meeting other high pointers out here, but it was so refreshing to be all alone and enjoy the trail together. We began going up rather steeply soon after the start of the trail, and it didn’t take long to reach 10,000 feet. The first 3 miles were the steepest part. During this time, we went up nearly 3,000 feet in elevation. After that, it evened out for a while. We took many breaks for snacks — this time, we had Gatorade, Chexmix, Clif bars, and lots of chocolate. It seems that we were too excited about the concept of buying junk food while stocking up that we may have fallen short on actual meals…but that wasn’t a big deal, as this hike wouldn’t even take all day. The hardest moment for me came somewhere along this long, steep stretch when I started feeling dizzy and a bit nauseous. I knew these were signs of altitude sickness, so we sat down out of the wind and I took deep breaths. Curtis offered me a Clif Bar, and I reluctantly ate it, but almost instantly started feeling better. We continued to take breaks to catch our breath and eat chocolate, but the doubt slowly started to leave my mind. 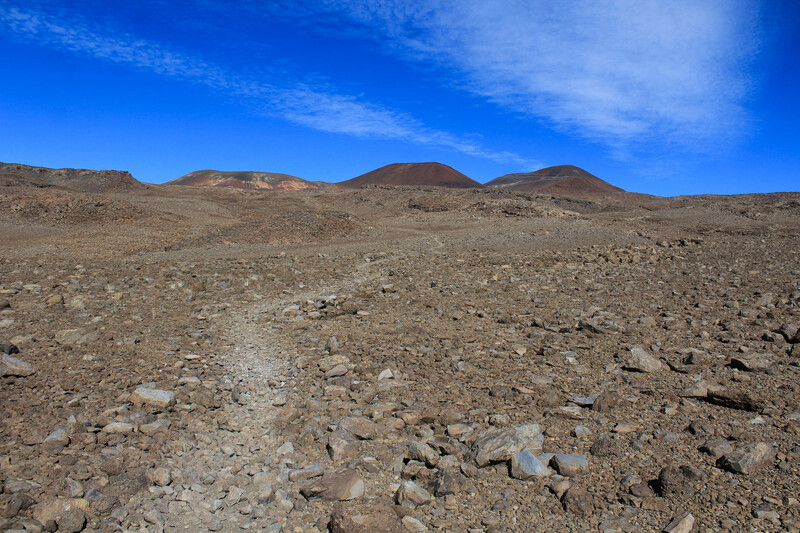 Compared to Mauna Loa, the terrain is much brighter with orange and red rocks. The trail was more worn and easy to follow. 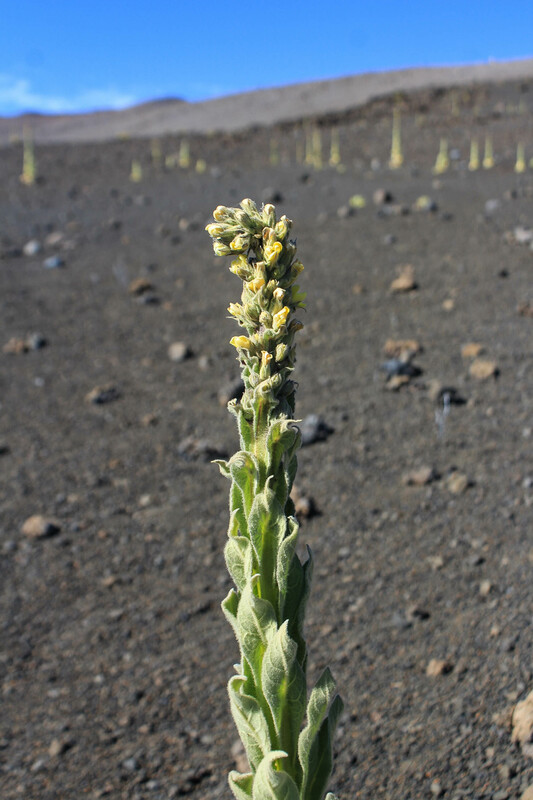 There were plants along the way that reminded us of silver swords on Haleakala, but different somehow. We loved being able to look down on the Saddle Road and see the various smaller craters. I had wondered if I would like Mauna Loa better when it was a view in the distance, but it still just looked like a big, long, unimpressive mountain. 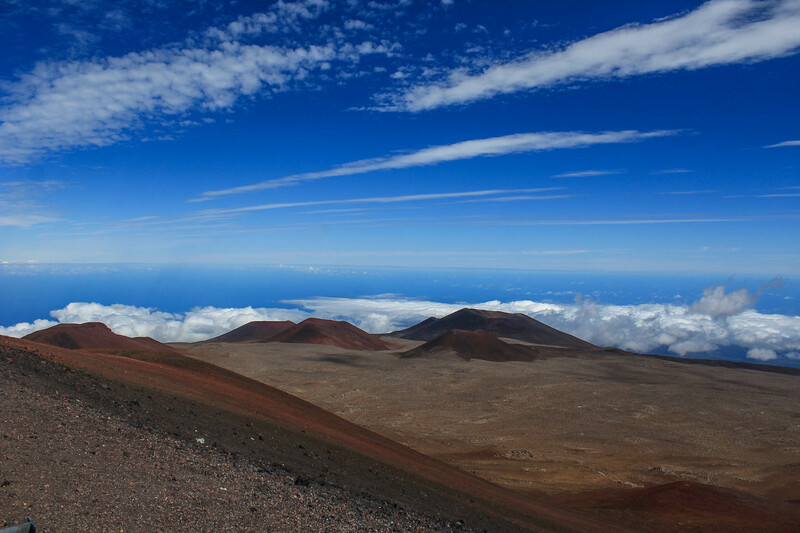 I think that the constant progress that we were making and the prettier surroundings helped our mindsets on Mauna Kea, but we knew that without our long and tiring experience on Mauna Loa, we wouldn’t be feeling as good as we were now. The weather was similar to that on our backpacking trip, except today it was much windier. It still wasn’t strong enough to push us around, but sometimes it would steal the air right out in front of our faces so we had to turn our heads in order to take deep breaths. My favorite moment came about 2 miles away from the summit when we stopped and looked ahead, and realized that we could see the peak from where we were. It was in that moment that I really believed we were going to make it. The next mile hiking up to the road went by rather quickly and was filled with enthusiasm, and a little bit of disbelief. We were actually going to make it! 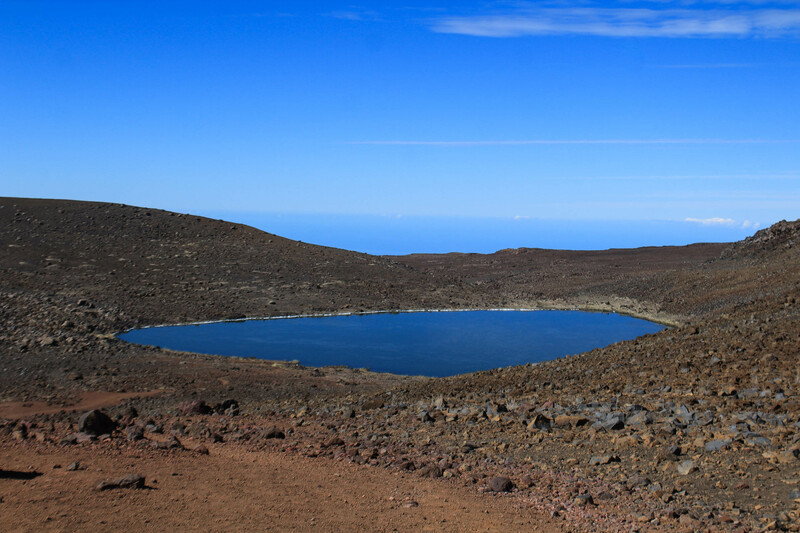 We came to a junction in the trail, and we wandered up to the left briefly to get a look at Lake Waiau. We just walked far enough to be able to have a view overlooking it, and it was definitely worth it. We then continued up to the road. The final push to the summit is along the summit drive, which is paved at the top. We had our first great views to the Northeast and North as we switchbacked up to the peak. A few cars passed by, but it wasn’t as busy as we thought it would be. Finally, we arrived at the end of the road. 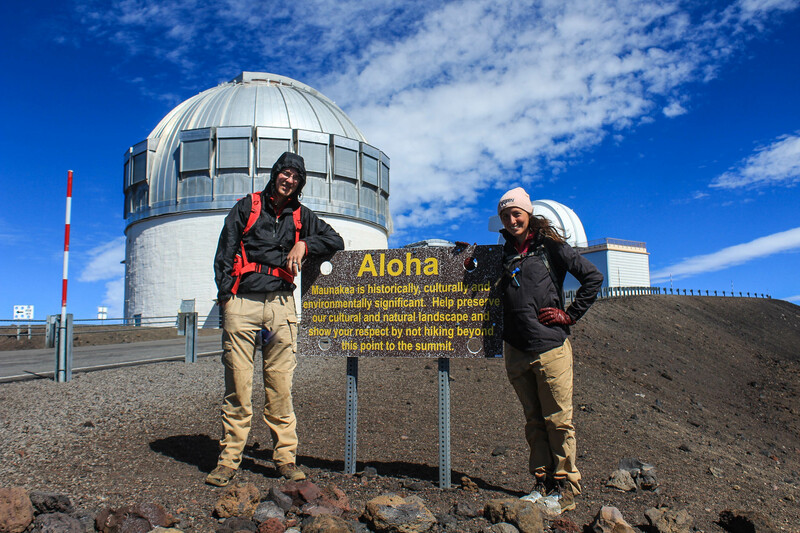 The true summit of Mauna Kea is protected and sacred, and while we could see that there was a worn path that led up to the mound, we decided to respect the Hawaiian culture and admire it from a distance. It still counts, guys. We did it! This is our 14th state high point, and only one accomplished in 2018. Long anticipated, and proved to be worth the wait. Not only that, but as of now it is also the highest mountain we’ve ever hiked at 13,796 feet. We had our picture taken next to the sign by some people who had driven up, then we wandered around the telescope on top and enjoyed the views in all directions. When planning this hike, we considered the idea of getting a ride back down to our car. The day before when hiking down Mauna Loa, it seemed like a good idea. However, we enjoyed hiking Mauna Kea on the Humu’ula Trail so much that we were excited to hike back down and enjoy every step. We definitely didn’t regret this decision! As we hiked down, we watched clouds roll in over the valley between the mountains, and took time to enjoy the parts of trail that we had struggled to walk up earlier that morning. We made it back to our car mid-afternoon, then spent a little time around the visitor’s center before beginning our drive back to our campsite. Unfortunately, Curtis’ phone died on the way up so we don’t have an AllTrails recording of this hike. 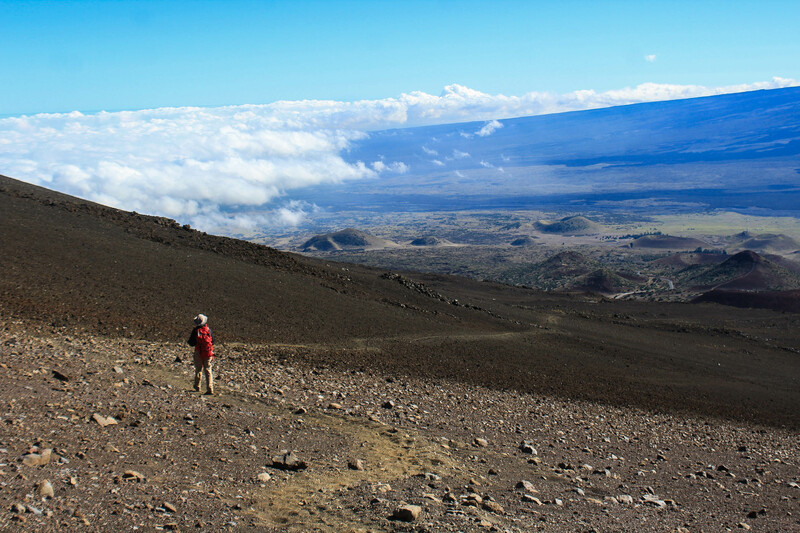 If you’re interested in hiking Mauna Kea, check out the listing on the AllTrails website.